I remember Cynthia not making the train, which was terrible and very symbolic. She was the only one of our party not to get there. There's a bit of film of her not making it. That was the end of her and John, really, weirdly enough. There was a big crowd at the train station, and there was another to meet us in Bangor. We all wandered through in our psychedelic gear. It was like a summer camp. The seminar was in a school: you sit around and he tells you how to meditate, then you go up to your room and try it. JOHN LENNON: There's none of this sitting in the lotus position or standing on your head. You just do it as long as you like: ‘Tventy minutes a day is prescribed for ze verkers. Tventy minutes in ze morning and tventy minutes after verk’. It makes you happy, intelligent and [gives you] more energy. I mean, look how it all started. I believe he just landed in Hawaii in his nightshirt - all on his own, nobody with him - in 1958. One of his analogies is it's like dipping a cloth into gold. You dip it in and you bring it out. If you leave it in it gets soggy, like you're just sitting in a cave all your life. And if you bring it out, it fades. So the meditation is going in and going out and going in. So after however many years when you bring it out, it's the same. You don't have to go to Wales and do it, or even cur yourself off from society and reality. And you don’t have to get so hung up about it that you go round in a trance. I can't understand why people are so stubborn and why they're not open-minded. If the Maharishi was asking people to devote their lives to meditation, that would be different. But what possible harm can it do anyone to try for half-an-hour a day? RINGO STARR: Maureen had had the baby and everything was really cool, so we all went to Wales to meet Maharishi. He didn't know who we were then, which was really fabulous. Only when we got off the train and he saw all the kids running, I think then he may have felt, ‘Wow, things are looking up for me.’ They ran right past him and were looking in our faces, and I think he realised that these boys could get his message across real fast. And so after we met him, he brought up the idea of us going on tour again and opening up a place in every city. But we didn't do that, because things began to change. Introduction to Meditation (left to right): Jane Asher, Paul McCartney, John Lennon, Cynthia Lennon, Maharishi Mahesh Yogi, Pattie Boyd, George Harrison, Ringo Starr & Jenny Boyd (Pattie's sister). 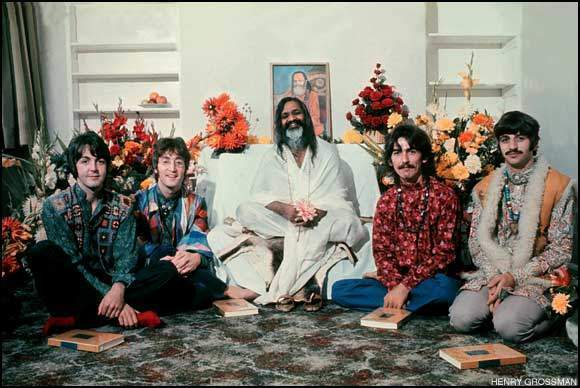 RINGO STARR: I was really impressed with the Maharishi. I was impressed because he was laughing all the time. That really struck home the first time I saw him: this man is really happy and he's having a great time in life. So we listened to his lectures, we started meditating and we were given our mantras. It was another point of view. For the first time, we were getting into Eastern philosophies - and that was another breakthrough. JOHN LENNON: Bangor was incredible. Maharishi reckons the message will get through if we can put it across. People know us, know how we think, how we were brought up and what we've done. Well be able to explain it to them, and they’ll understand, and they know we're not trying to trick them. The thing is, that the more people who do it, perhaps one day one of them will be prime minister or something. He'd be better than Harold Wilson, anyway, wouldn't he? If there's any possibility of getting this across, it's worth it. At the very least, it can't do any harm. What he says about life and the universe is the same message that Jesus, Buddha and Krishna and all the big boys were putting over. If you ask Maharishi for a few laws for living by, they'd be the same as Christianity. Christianity is the answer as well; it's the same thing. All the religions are all the same, it's just a matter of people opening their minds up. Buddha was a groove, Jesus was all right (but Maharishi doesn't do miracles for a kick-off). I don't know how divine or how superhuman he is. He was born quite ordinary, but he's working at it. MAHARISHI MAHESH YOGI: They came backstage after one of my lectures, and they said to me: ‘Even from an early age we have been seeking a highly spiritual existence. We tried drugs and that didn't work.’ They are such practical and intelligent young boys that it took them only two days to find that Transcendental Meditation is the answer. JOHN LENNON: Another groovy thing: everybody gives one week's wages when they join. I think it's the fairest thing I've ever heard of. And that’s all you ever pay, just the once.